On my 27th birthday I decided to take a trip to Boracay. Alone. Yes, this is my first time to travel by myself. The first time I went toBoracay was with my good friend on his birthday last Aug 2013. That was awesome! This time is more personal hence I traveled solo. A lot of travel guides would tell you to go island hopping, banana boat, helmet diving and other mainstream stuffs. I have tried it already and don't wanna do it again. Through observation and feedback from locals, here's what I did worth trying in your next Boracay trip. There are countless benefits of staying in a dorm or a hostel. But the top 2 reasons I considered most important is this: (1) cheap accommodation and (2) best avenue to meet like-minded travelers. Some people are not comfortable staying in a hostel for safety and convenience purposes. I respect that, especially for women. But if you think about it, you don't really need a luxurious room since you will be going out most of the time. In the room there were 10 of us - 8 are from other countries and 2 of us are Filipinos. I got to know them and learned that they are from Canada, Singapore, China, Sweden, USA and United Kingdom. Pretty diverse. I happened to know Daniel, a young consultant from UK also traveling alone. Ever since I knew him we went out together. Had a great time with this fella. I stayed at MNL Beach Hostel. The rooms and bed are pretty decent. For a very cheap price it is definitely a steal. Rooms are air-conditioned, mattress is fairly clean, staff is very accommodating and there's even a FREE breakfast. How's that for a P450 ($9) rate? Initially, my birthday trip was intended for soul-searching. On a first thought I chose Coron. But since I would travel alone, I imagined life would be lonelier since nightlife is dead in Palawan. I opted for Boracay instead. Clubs are sprouting like mushrooms in Boracay. Sunset is spelled P-A-R-T-Y. As soon as the sun is down, party-goers start flocking at the shore. Right after our Mongolian buffet dinner, we joined the Boracay Pubcrawl. For P900 ($18), we were able to meet good friends and 5 clubs including complimentary drinks. A yellow shirt and a rubber bracelet is provided as well to recognize participants during the pub-crawl. One thing worth noting about Boracay Pubcrawl is that it is introvert-friendly. They are aware that most of their guests are solo travelers hence they have games that encourages participants to introduce themselves to other people. Watch out for it! I'm pretty sure it'd be fun for you too. Whether you are a smoker or a non-smoker, this is a one-time experience you should never miss. For P600 ($12), one session normally lasts an hour. This is the first time I smoked a shisha and with no bias, it really felt great. I was surprised that the smoke is sweet and pleasing, not harsh compared to tobacco. Daniel and I had a very relaxing night smoking a shisha while gulping an ice-cold beer. You can find a lot of hookah bars along the shore. As for a meal, there has to be an entree, main course and a dessert. For me, pub crawl is the entree, hookah is the dessert and cliff jumping is the main course. Cliff jumping is one of the most unforgettable experiences I've done. And when we talk about cliff jumping, only 1 name dominates - Ariel's Point. Ariel's Point is a daredevil's paradise. It is located 15 minutes away from Boracay (via boat) where you can jump off a 5, 8 or 15 meters cliff. For P2,500 ($50) you can eat, drink and cliff jump all you want! Crazy deal. Oh and it also includes boat transfers to and fro Boracay. 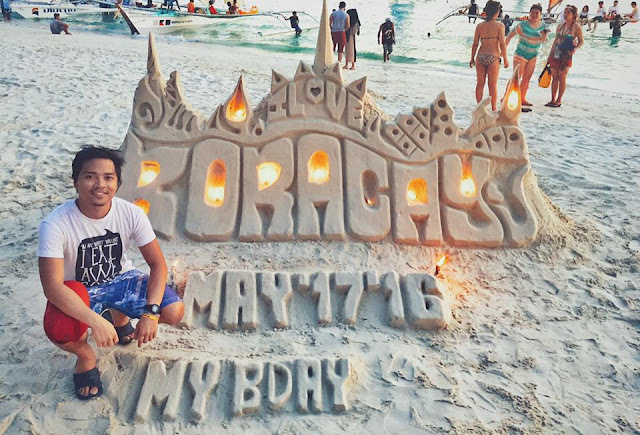 My birthday trip would never be complete without the Boracay sandcastles. I was about to have someone take a picture of me near the sandcastle when I saw a customized message that says, "I love Haifa"
I asked a boy to create a phrase "My Bday" under the sandcastle. It was awesome! With excitement, they immediately snap photos. Happy 27th birthday to me! My solo birthday trip is the best ever. I got to do a lot of first times - stayed a hostel, pub crawl, cliff jump and smoke a shisha. I never regret the decision to travel alone. Though there are really times when you need a close friend to talk or go with you, the emotion just passes by. But if this emotion lingers and bothers you, this is the time you need to meet new people and listen to their stories too. Who knows, you are sharing the same feelings and you can relate to each other. Solo trip is, however, not meant to be done all the time. It is when you need to reflect, release the tension, restore the muse and do the things you want to do without inhibitions. What about you, ever done a solo trip? Where did you go and what have you done? This is a gem.. haven't seen any of these from other blogs. Great post!